and see Erik Svensson’s blog post for an interesting take) and will get an impact factor and be in their Citation Index and all such things. Now mind you, I think “Impact Factor” is a silly thing overall in that we should evaluate papers not journals per se. 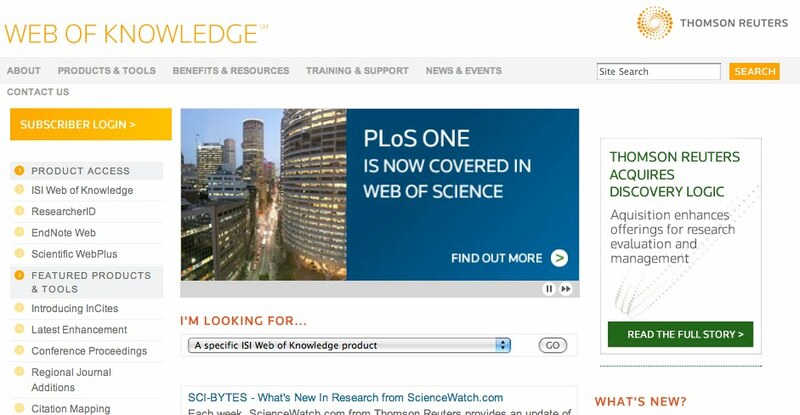 So why am I writing this – because I find it pretty funny that despite being slow to recognize PLoS One ISI is now promoting the fact that they are indexing PLoS One on their home page. See the screen capture above. I know it's a classical and old question, but I still wonder why ISI doesn't count Reviews and Perspectives but counts their citations. This boosts the IF of journals like Science and Nature (which have a perspective article describing–and citing–every other research article). PLoS ONE, with almost no reviews (only two or three collections intros) is collecting an average of 3.5 citations per article now. Very impressive!